Of course, don’t ever tell anybody that they’re not free, ’cause then they’re gonna get real busy killin’ and maimin’ to prove to you that they are. 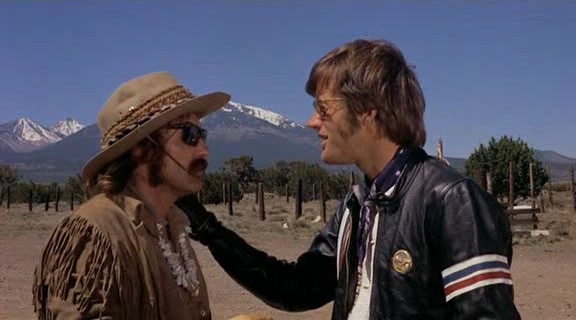 In the movie two bikers Billy (Dennis Hopper) and Wyatt, aka Captain America (Peter Fonda) make a major drug deal with a LA connection (Phil Spector). With the cash safely tucked away in the stars and stripes gas tank of Captain America’s bike, they head to Mardi Gras for the last party before retiring to Florida. On their way through Vietnam-era America they pick up a hippie hitchhiker (Luke Askew) and take him to a struggling commune in the desert. While driving thru a small-town Billy and Captain America manage to get arrested for parading without a permit. 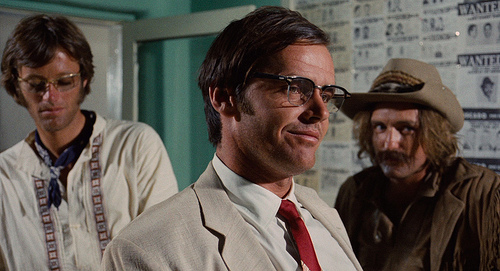 In the jail they meet an alcoholic ACLU lawyer George Hanson (Jack Nicholson). Hanson joins Billy and Captain America on their road trip only to find brief joy in smoking grass for the first time before he meets his grisly end in the hands of Southern rednecks. Wyatt and Billy continue their quest. They finally reach New Orleans and join the Mardi Gras after honouring Hanson’s memory by visiting “the best whorehouse in America” (which they were planning to do together). Billy’s and Captain America’s celebrations climax with a couple of hookers (Karen Black and Toni Basil) and some LSD at a local graveyard. Will they make it to Florida to retire? That’s for you to decide after Billy and Captain America are once again met with bigotry and hatred just because they ride motorbikes and have long hair. 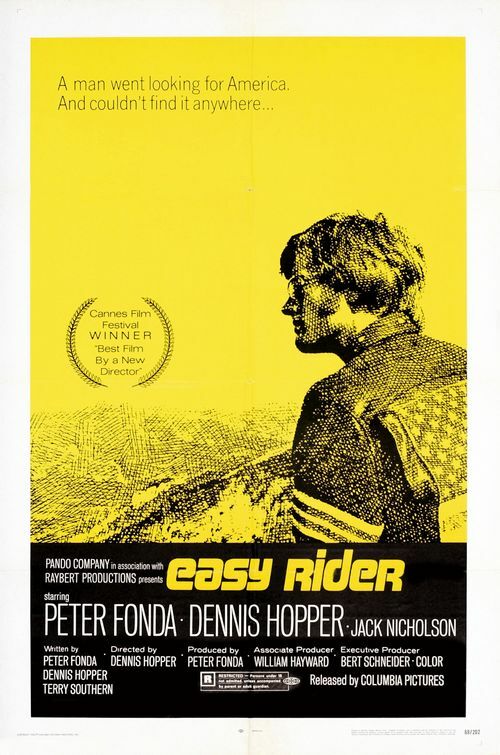 Produced by Fonda and shot by Hopper Easy Rider paved the path for socially relevant and documentary-style movies. It takes a sober look at the end of the flower-power era and a country that has lost its ideals. Most of the dialogue was improvised and the realism in being stoned comes from – well – really being stoned. The Mardi Gras sequence was shot first on 16 mm film. At this point Hopper and Fonda had gathered a crew out of their friends and acquaintances. According to both of them it was such chaos and a lot of the people quit because of Hopper’s antics, so after that they hired a professional crew and screenwriter. Both Fonda and Hopper deliver excellent performances as two friends looking for something, yet not quite knowing what. This is the movie that made Jack Nicholson a movie star and he is enigmatic as Hanson who puts into words what everybody is feeling. 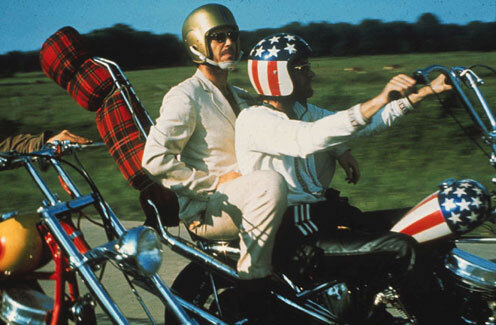 Easy Rider is filled with symbolism – from tossing of the wristwatches, stuffing money into the stars and stripes gas tank to scoring “junk” on a junkyard. It starts as a road trip movie with long sequences of Billy and Captain America riding through iconic American landscapes in the style of Westerns, but it ends with a much deeper look at the ignorance and narrow-mindedness that too often results in unnecessary violence. I found the end such a shock that it will stay with me for a long time. This is a movie that everybody should watch and it would hopefully make them more open-minded.